This felt patch came out in the late 1930s to early 1940s. 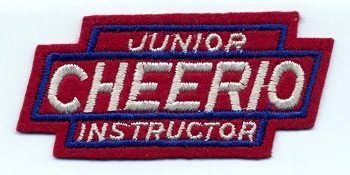 It was typically sewn onto an award sweater vest as seen in this photograph of three 99 Cheerio champions. The "99" was the name of Cheerio's popular yo-yo model in the 30s and 40s.